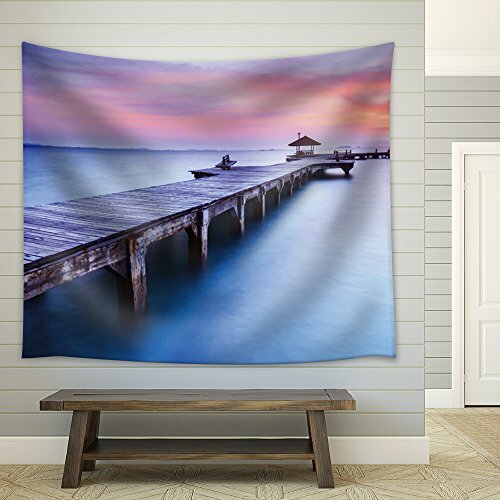 Hung as a wall tapestry and put string lights behind it. I can't wait to get some black lights. My favorite tapestry! So beautiful and vibrant! Also great material. I’ve gotten so many compliments on it! If you’re debating getting it, DO IT! Beautiful image, clear and sharp. Maybe a touch darker in real life than photo image, and may a tinge more brown. Overall quite satisfied. It hangs on a wall at an indoor swimming pool, Many compliments received from pool patrons. I have bought a second one, with a different image to go on another wall. It is better even in person, was a birthday gift for my daughter, she loved it. This is super cool. I bought it for my son's dorm room, covers a whole wall. VERY thick fabric, which I personally don't like. Colors are flashy, almost unnatural. Maybe on a thinner fabric, it would have blended in better. This was a perfect addition to my office!! It's thick, lays flat, and it a centerpiece that is the talk of everyone who comes in.